As a side trip to a Mykonos, Greece vacation, I took a boat across the Aegean Sea to the uninhabited island of Delos. The ride was both scenic and enjoyable. Being a history lover, I did not realize what a treat that I was in store for. 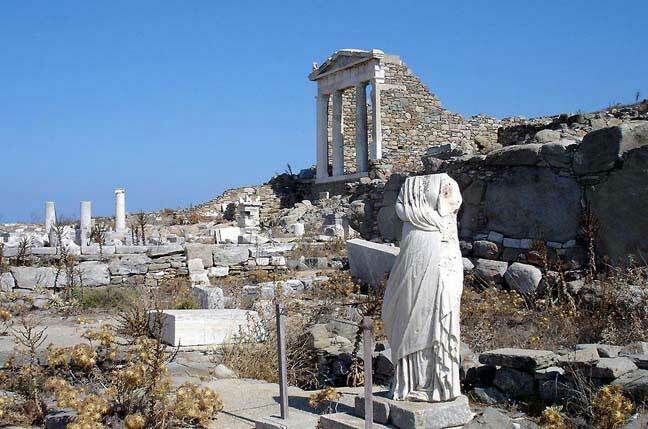 Delos, which translates to “light”, is located in the midst of the Cyclades. It is an extremely important mythological, historical, and archaeological site. According to the myth, Zeus had several mistresses. One of them, Leto, became pregnant with twins. Zeus’s wife, Hera forbade anyone from allowing Leto to birth her children at their home, so Zeus struck up a deal with his brother Poseidon. Poseidon struck his trident into the Aegean Sea and the island of Delos sprung to life for Leto. Leto gave birth to twins, Artemis (goddess of the moon) and Apollo (god of light, harmony, and balance). Artemis and Apollo were two of the most important deities in Greek mythology. It is thought that around 3,000 BC, the island of Delos, Greece had as many as 25,000 residents and was the trading center of the world. It was bustling with textile makers, merchants, and Italian traders. Delos appeared in historical documents in 14th century BC but became an important pilgrimage destination in the 7th century BC. It rose to its height of commerce throughout the next years. After many attacks and raids in the 1st century BC, Delos finally collapsed. By 300 AD, the island was completely deserted, left with one lone palm tree which has a significant meaning in mythology. The excavation of Delos started around 1872. It is still in the works today and has unearthed numerous houses whose inhabitants laid mosaics in their courtyards depicting tigers, dolphins, and religious idols. Houses typically had ground floors for dining rooms, latrines, kitchens and working rooms. Upper floors were private for the owners and women’s quarters. My favorites were the House of Cleopatra and the Temple of Apollo. The remains showcase the masonry and intelligence of their craftsmanship, and the oil and water systems were truly remarkable. Although wealthier houses contained wells, it was evident how the rain was collected and irrigated through systems in the streets. Other favorite areas of Delos, Greece were the classical Theatre Quarter, where 5,500 people could watch the arts at one time, the Grotto of Hercules, and the House of Dionysus, a huge mansion with standing pillars and spectacular mosaic tiled floors. One of the mosaics shows Greek God Dionysus taming a panther. The Sanctuary of Apollo, located in The Sacred Way area, has a statue piece of Apollo’s torso. Other parts of the body are located in various museums. I saw one of them in London’s British Museum years later. The Terrace of the Lions is probably the most recognizable part about Delos, Greece. The Lions were gifted in the 7th century BC. I have seen this particular scene, of the marble lions guarding Apollo’s mythical birthplace, photographed in countless travel magazines, history books, as well as on postcards. It was spectacular to see firsthand. It is thought that there were originally 10-12 lions guarding the trade port, but only 7 remain for our viewing pleasure today and can be viewed in the Delos Museum. The Delos Museum is a great place to not only see the amazing artifacts along with placards that give a brief description of each piece but to cool off from the sometimes scorching heat. It has beautiful pieces including tools, jewelry, and sculptures. A surprising thing about Delos is that only one small lake, Sacred Lake, was on the island. Around 1925, it tested positive for malaria so it had to be filled in. On the ground remains one lone palm tree, in honor of the one Leto clutched while delivering her divine twins. Delos is a UNESCO World Heritage Site. The sprawling grounds are free to explore, but nobody is allowed on the island after 3PM when the last boat leaves. Delos is closed to visitors on Mondays. Fact: The island group called the Cyclades is home to Delos and nearly 220 other islands. Other major islands in this group include Mykonos and Santorini. I am big fan of Greek Mythology since I was a kid but didn´t remember story of Artemis and Apollo. So much interesting stories in only this island, I would definitely go if I ever visit Myknos. I have never heard of this island, and it definitely looks worthy of a visit. I love a good myth – ancient greek or modern! I also love a Greek isle, any of them…but haven’t been to Delos. I’ve got to put it in my list! I always wonder what the origin on those myths and stories is… I can just imagine the first person on the island telling tales, and thousands of years later they’re still told! Wow !! Sounds like a wonderful historical place to visit. Thanks for sharing ! It was! Thanks so much for stopping by. It’s always nice to have a little history lesson! This is incredibly interesting, Melody. Do you know if they intend on keeping the island uninhabited, or if people will eventually move onto it? All the things I’ve read on Delos is that they will keep it uninhabited. Nice, eh? 😉 I love history. (would never have guessed those words would come out of my mouth 20 years ago) Thanks for stopping by. I’m a huge history lover myself and haven’t spent anywhere near as long in Greece as I would like. Delos sounds awesome though! I’ll definitely have to add it to my list! Loved this article as I lived on Greece in my early twenties; worked on Paros and had the time of my life. Reading your post brought back a lot of great memories and even the embryo of a plan to return. Great! Lucky man! Thanks for stopping by and I hope you make it back. Safe travels. Yes, they do. Thanks for stopping by. Hope your new year is going well thus far. Awesome! I can remember 10 years ago absolutely hating history, but when you submerge yourself in the magic of it, and can relate to it by being in the vicinity, it makes all the difference. Thanks for stopping by. Greece has such an amazing combination of history and beauty. That mosaic floor looks pretty magical! It was beautiful. I love the fact that Europe preserves all their beauty, unlike in the United States. Thanks for stopping by. Luke, I am such a non-partier but in Mykonos, all I wanted to do was go to all the clubs and party until 4AM. Sigh, those were the days. I hope you make it there but when you see how much fun the clubs are, you’ll find the energy you need. This is the second time this week I’m reading about Delos. I just read a beautiful account by a Lonely Planet picked writer, on how he “missed” the boat back, in order to spend the night on the island. Reportedly it’s supposed to be quite still and a real chance to get OUT there! Interesting. I enjoyed it a lot and plan to go back on my Greece trip 2016. Thanks for stopping by. I have been wanting to go for a while. Great article and photos!! As you said, there’s so much more to Greece and its islands than sun and sand. Good for you for searching it out.